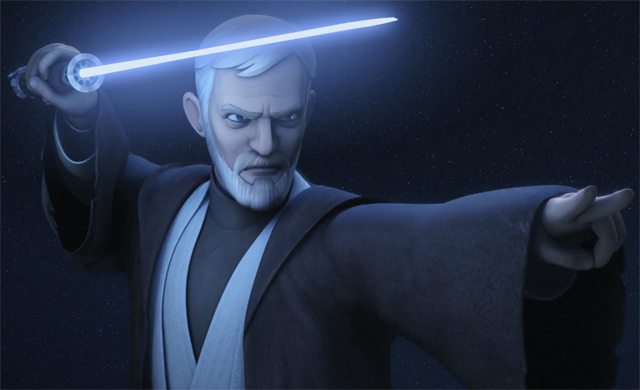 Titles and descriptions for the final five episodes of Season Three of the animated series Star Wars Rebels have been revealed. The titles and descriptions were discovered on Zap2It by Jedi-Bibliothek. The series is currently on a hiatus, with it returning to screens on February 18th with the episode "Legacy of Mandalore". After that, the only title we knew prior to today was "Through Imperial Eyes" which will air on February 25th. When a routine refueling mission goes wrong, the Ghost crew find themselves transporting an important rebel leader across the galaxy, pursued by Imperial warships. Chopper and AP-5 team up to infiltrate an Imperial station to steal needed codes, but an Imperial specialist turns the droids against the crew to cause chaos. Reacting to a vision of Maul, Ezra defies Hera and Kanan to travel to a remote planet in hopes of stopping the former Sith lord from carrying out his plans. In final preparations for their attack on Lothal, Phoenix Squadron’s plans are disrupted when Grand Admiral Thrawn discovers their location. Trapped on Atollon with the rebel base under siege, Hera and Kanan fight to keep the squadron alive, as Ezra attempts to rally help from an unexpected source. Those sound like interesting episodes to close out the season. I'm a little (pleasantly) surprised that the season finale is not the Obi-Wan vs Maul episode that was teased at the end of the trailer. Logically it makes more sense to end on a showdown between the Rebels and Thrawn, but it seemed like it might have been too difficult to resist the publicity opportunity of ending the season on the Phantom Menace rematch.